Most of these people are employed at think tanks or sell their predictions to credulous investors. Would they need that salary check or your hard-earned subscription dollars if they had the ability to make billions just by checking the old crystal ball a couple of times a day? 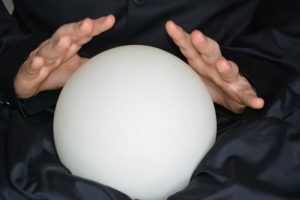 A recent article by frequent blogger Barry Ritholtz offers some rather amazing data on people in the prediction business. You may know that the cryptocurrency known as “bitcoin” is now worth about $3,500—way WAY down from the start of the year. So how well did the people in the prediction business foresee that downturn? Not well. In his article, Ritholtz noted that Pantera Capital predicted Bitcoin would be selling for $20,000 by the end of this year. Tom Lee of Fundstrat was more bullish, forecasting that bitcoin would breach $25,000 by now. Prognostications by Anthony Pompliano, of Morgan Creek Digital Partners, were still more bullish, predicting bitcoins worth $50,000 by the end of this year. John Pfeffer, who describes himself online as “an entrepreneur and investor,” anticipated $75,000 bitcoins by now, and Kay Van-Petersen, Global Macro-Strategist at Saxo Bank, one-upped everybody with his prediction that bitcoins would be worth $100,000 by December 31 of this year. Ritholtz offers other examples, like radio personality Peter Schiff telling listeners since 2010 that the price of gold has been heading toward $5,000 an ounce. (It’s riding around $1,200 currently.) Jim Rickards, former general counsel at Long-Term Capital Management, is more ambitious, telling his followers that he has a $10,000 price target for an ounce of gold. If you happen to follow former Reagan White House Budget Director David Stockman, you have been told that stocks are going to crash in 2012, 2013, 2014, 2015, 2016, 2017, 2018 and 2019. Someday he’s going to be right, and he will no doubt be touting his amazing prediction abilities.